Derry City FC manager Peter Hutton with new signing Anthony Elding. The 32 year old striker has signed until the end of July with an option of extending his stay at the Brandywell after that time. 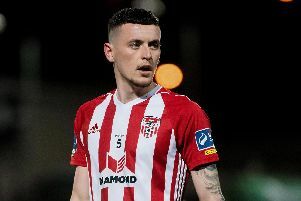 “We’d like to take this opportunity to welcome Anthony to the club and hope he does well in his time here at the Brandywell,” he said.